This chapter defines sleep technology as notably different from the current concept centered on polysomnography and issues related to sleep technicians only. Through the “chemical reaction” of sleep medicine, psychology and engineering, sleep technology might be closely related to our daily life. Nelson Powell, M.D., D.D.S., Clinical Adjunct Professor, Stanford University Sleep Disorders and Research Center, CA, U.S.A. This chapter is expected to present the sleep disorder related disasters and accidents and how sleep technology could prevent these tragedies. Jean Krieger, M.D., Ph.D., Professeur Honoraire, Faculte de Medecine, Universite Louis Pasteur, Strasbourg, France. This chapter is expected to present the history and evolution of the sleep related evaluation instruments, current applications and future development of them, focusing on polysomnography. Edward Weaver, M.D., M.Ph., Associate Professor, Department of Otolaryngology Head and Neck Surgery, Washington University, Seattle, U.S.A. This chapter is expected to present the importance of sleep evaluation instruments other than polysomnography. Current applications of instruments for “surrogate” outcome evaluation are to be stressed, which enable sleep professionals to use and design these supplements or to validate the effectiveness of them. This chapter is expected to present the importance of questionnaires, such as ISS-C (Insomnia Screen Scale – Chinese Edition). The chapter will show the readers the questionnaires usually used in hospitals, how these questionnaires were developed and how they can be used to correctly explain the results. This chapter is expected to present the importance of actiwatch by introducing the unit of the actigraphy and explaining why we use this device so often. Current applications and future development will be stressed. This chapter is expected to present the rationales of aassessment of sleepiness and fatigue, using both traditional and novel technologies. The relationship between nighttime sleep/daytime naps and sleepiness/performance will be discussed by ways of the mechanisms of alternating vigilance states. Management of daytime somnolence from the point of view of technology will also be addressed. Kannan Ramar, M.D., Assistant Professor of Medicine, Division of Pulmonary, Sleep and Critical Care Medicine, Mayo Clinic, Rochester, MN, U.S.A. This chapter is expected to present the basic respiration physiology in sleep and the mechanisms and design of cPAP machine, including its drawbacks in clinical use. Newly developed strategies will be discussed. This chapter is expected to present the formation of concepts and applications of different surgical modalities from a technological perspective. The diagnostic tools used for upper airway before surgery will also be stressed. Chol Shin, M.D., Ph.D., Director and Associate Professor of Pulmonary Sleep Disorder Center, Department of Internal Medicine, Korea University Ansan Hospital. Clinical Associate Professor, Geriatric Departement, University of Hawaii. This chapter is expected to present the basic pathophysiology of positional obstructive sleep apnea syndrome and the mechanism of positional therapy, including the determinents for optimal sleep position. A novel design for the positional therapy will be discussed. This chapter is expected to present the basic theory of cognitive behavioral therapy for insomnia, and provide some suggestions for the insomnia scenairo through the introduction of sleep technology. This chapter is expected to present the basic theory and clinical protocols of light therapy in different circumstances, such as circadian rhythm sleep disorders, shift workers and jet lags. Future applications through sleep technology will be addressed. This chapter is expected to present the basic theory, different types of biofeedback and the benefits for the users. The latest research results and future development of biofeedback with sleep technology will be described. This chapter is expected to present the basic ideas of “Sleep Technology Engineering” through the illustration of Sleep Coach. Furthermore, the concepts of sleep technology engineering enable the professionals to develop the sleeper-centered bedroom and creat better a sleep environment. Chih-Ting Lin, Ph.D., Assistant Professor, Department of Electrical Engineering, Taiwan University, Taiwan. This chapter is expected to present an introduction of biosensors. The latest research results and future development of biosensors on sleep technology will be described. Sei-Wang Chen, Ph.D., Professor, Department of Computer Science and Information Engineering, National Taiwan Normal University. This chapter is expected to present the relationship between sleep and driving safety especially for professional drivers with rigid and/or shift work schedules. Some sleep technology could help monitoring, screening or managing drivers’ sleep problems, thereby preventing subsequent tragedies on the roads. Michael V. Vitiello, Ph.D. Professor, Psychiatry and Behavioral Sciences, University of Washington, Seattle, W.A., U.S.A. This chapter is expected to present the causes, consequences and managements of age-related changes, both physiologically and pathologically, in sleep. Application of technology to help the elderly at home and nursing care systems on sleep disturbances will be stressed. Christian Guilleminault, M.D., BioD., Professor, Stanford Sleep Disorders and Research Center, CA, U.S.A. 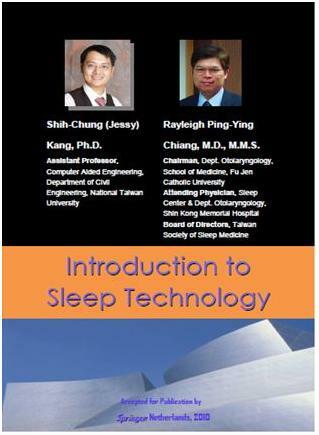 This chapter is expected to present the importance and necessity of education on sleep technology. The ways of performing education on sleep technology will also be mentioned, including a historical overview on the development of sleep medicine technology education. The experiences of education on sleep medicine will be further references. Hung-Hsiang Chiu, M.S., Consultant, Innovation Incubator, National Tsing Hua University, Hsingchu, Taiwan. Consultant, China Youth Career Development Association, Taipei, Taiwan. Peter Liu, Ph.D., Assitant Professor, Department of Electrical Engineering, Tamkang University, Taipei, Taiwan. This chapter is expected to present the future of sleep technology, including the tools under development, the co-operation with industry, and technology management. An example from sleep coach will be presented.